The French president, François Hollande, was also spectator of the football match; he was safely rescued --- when a suicide bomber ripped inside the stadium, Stade De France! More than 1500 police personnel have been deployed to combat with onslaught and the president has declared national emergency. The army has also been alerted to be ready to face the situation of emergency. 158 people at least were killed and 200 injured by incessant firing and bombing in the serial terrorist attacks in the state capital of France. The different places in Paris were targeted in the attack. The ISIS took the responsibility of this attack. 100 people at least in Bataclan concert hall have been killed according to report. The police rescued many people by attacking on the gun-toting men. They had made people hostage there. The deadliest attack occurred near the arts center Bataclan; A few distances ahead of Bataclan, near Petit Cambodge restaurant, another; and third one near a bar beside the national stadium was attacked. At least 3 bomb explosions were reported. 7 suicide bombers among 8 terrorists were killed in police retaliatory combat. The French borders were sealed; the people were requested to remain inside houses. The army beefed up to help the police. 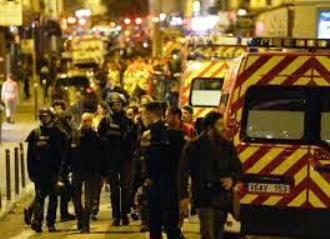 When the attack was started, it was the live telecast hour of soccer match between France and Germany in the stadium. Three men were killed inside the stadium. It is reported that the suicide attack occurred here.